nevard_100728_cornish-engine_IMG_7508_web, originally uploaded by nevardmedia. 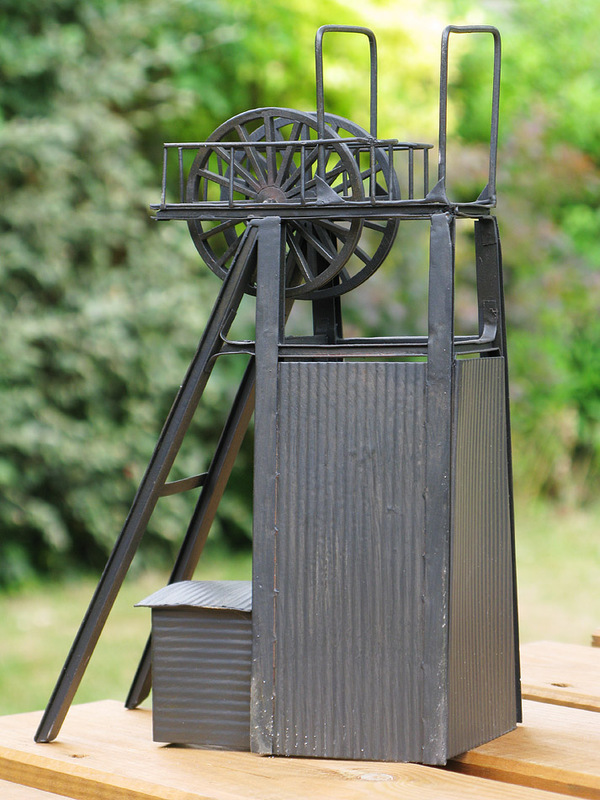 This afternoon it was a nice sunny one, so I moved out into the garden under the apple tree and made a start with the Cornish Pumping Engine for 'Mendip Colliery'. 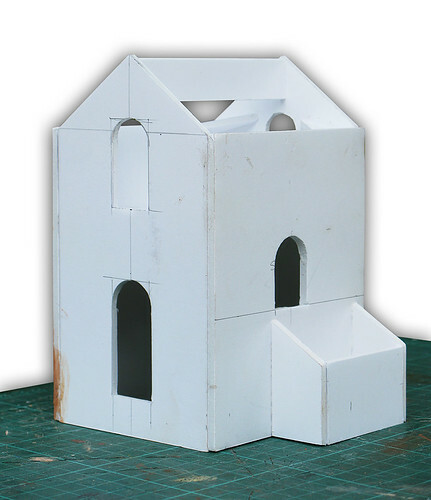 Rather than build around a resin or metal 'ready to plant' structure as before, a basic inner has been made up from 4mm foam board which is a fabulous material to quickly put together a sturdy base using PVA as an adhesive. Stone effect will be scribed onto a layer of Air Clay rather than use embossed plastic overlays. This will allow finer stone detailing around the curved apertures and corners. The slightly uneven surface will also help to create the rustic effect I'm after. Tests earlier today with this worked rather well. 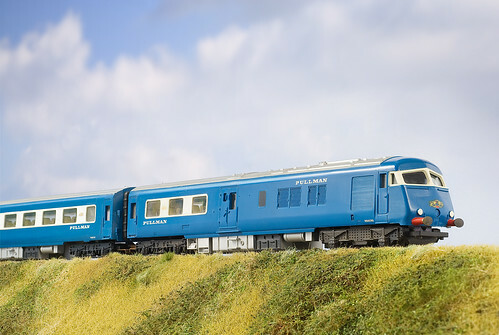 On Sunday 26 July 2010, Bachmann at their press day made the unexpected announcement that they hope to be producing the Blue Pullman after several years of enthusiasts hankering on internet forums and various web & magazine published 'wants lists'. For OO fans, until now unless you were a very keen scratchbuilder the only option would have been to pick up a the 45 year old Triang model which can command high rates for clean examples. 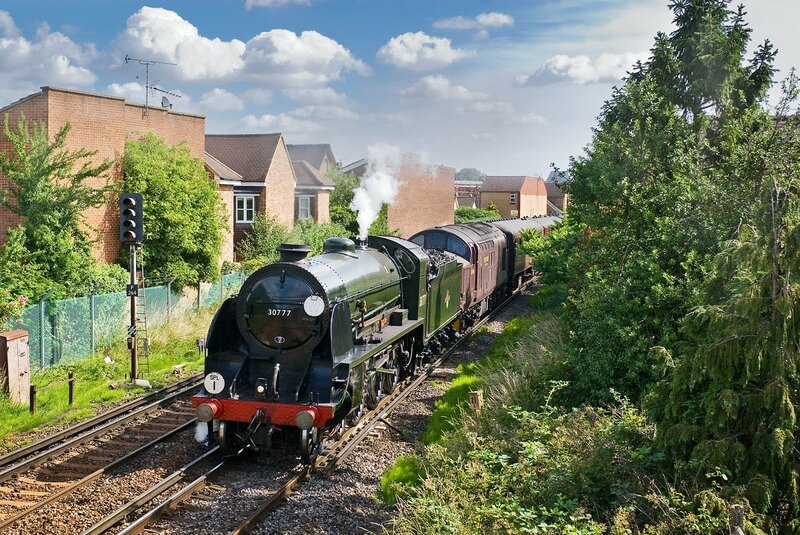 Today will no doubt throw water on Olivias Trains recent Heljan commission; but from an enthusiast's point of view competition might be good in that it will keep prices to a realistic level for the British enthusiast - should both manufacterers go ahead which I hope they do. I wonder too if Hornby will jump on the bandwagon with a re-release of the 1960's Triang release seen above under their budget but highly regarded Railroad range? Whatever the outcome, this is great news for the enthusiast that has been pestering manufacturers for one these attractive trains, let's just hope now that they open their wallets and buy one! nevard_100716_cornish-engine_COLOUR_web, originally uploaded by nevardmedia. 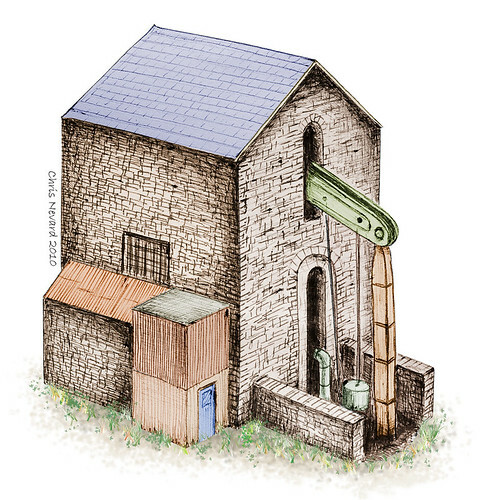 Cornish engines were steam powered beam pumping engines and mainly used to stop mines from filling up with water. 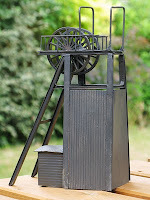 Also in the early days they were sometimes used to winch miners and their bounty in and out of the pit. The design developed strangely enough in Cornwall and was exported all around the world. Click here for find out more. 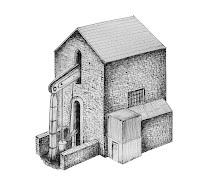 To try and keep that unmodernised rustic feel with my Mendip Colliery project (formerly Coal & Steam) I've been doodling about putting together an idea based on a mirror image of the Cornish Engine that used to be at Kilmersdon Colliery near Radstock. The side here is a bit of a mystery, however the web and mining books as always have many images to get inspiration from. 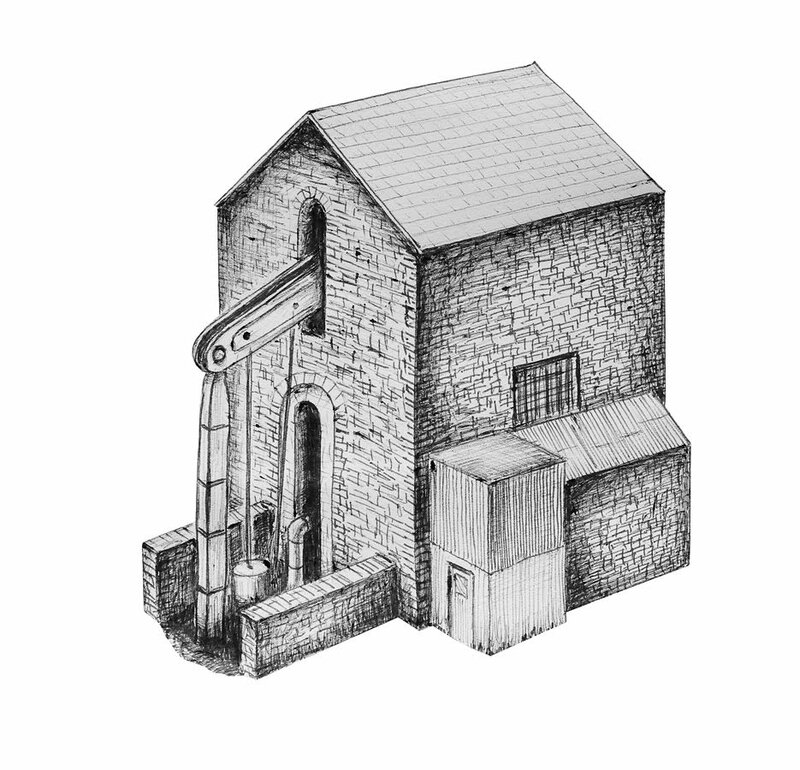 It's likely that I'll incorporate a nice chimney to the rear of the buildings - that has yet to be illustrated. Construction will be mixed media of foam board for the inner shell, embossed stone plastic sheet and paper. Whilst a brief precise of the contruction will be show here, it will form part of a greater feature for the printed page. nevard_100709_pirbright_46115_DSC_8253_web, originally uploaded by nevardmedia. 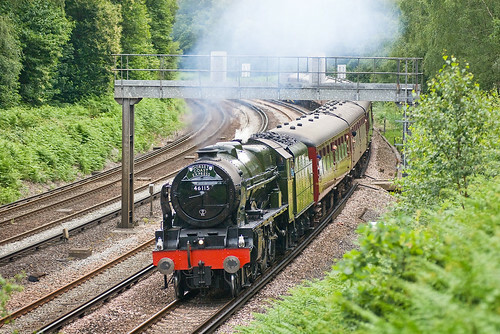 On Friday 9 July 2010, 43 years to the day after the last BR steam services ended on the former BR Southern Region, 46115 'Scots Guardsman' is captured powering along the down slow at Pirbright with the Dorset Coast Express. 090711_fleur_loco_IMG_5077_web, originally uploaded by nevardmedia. In the overcrowded UK with our often small houses it's very rare that a whole room can be taken over to run a nice roundy-roundy model railway. One of the problems this presents is that we are not able to run-in our latest purchases very easily, a compact end-to-end portable branchline or industrial complex not being ideal for such unless one wishes to go totally mad shuttling the loco back and forth. The answer might be to go back to those innocent childhood years of the trainset on the carpet in the form of a circle of track to allow ones pride and joy to run around for an hour or two in either direction to get the mechanism bedded in. The only problem you might encounter will be the cat because they don't quite hold the same esteem for the finer detail we all expect on models these days. 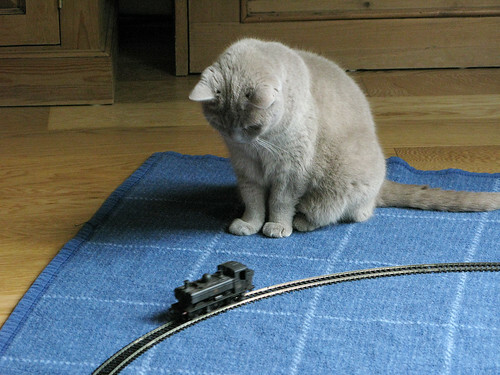 For shortly after this snap was take, Fleur took a swipe at the little locomotive – thwack! That's one of the reason for the blanket, firstly to avoid the paint being scratched as it hits the floor, and secondly to keep the noise level down on these fangled laminate floors. 30777 'Sir Lamiel' powers through Egham with the Swanage Belle on Saturday 3 July 2010. Moments before and after this photo was taken the sun went behind the clouds leaving this very lucky 30 second window of opprtunity - something that steam snappers will know is very rare! nevard_100706_pithead-8F_IMG_7410_web, originally uploaded by nevardmedia. A mock up on the dining room table with 'Coal & Steam' buldings so far completed. In case you think this project is further down the road that I've let on, the living room wall has been replaced with a blurry sky from the Bridport area using Photoshop to help me gauge where I'm going with this project. Since the previous update, I've addressed the brick areas on the shaft buildings at the rear, they now blend in alot better with the stonework and look far more natural. I'll post an update of that aspect in due course. The plan is to to feature this project in far greater detail on the printed page in due course, this will be with stage by stage illustrations backed up with my often offbeat but simple and very speedy techniques. Want to see a bigger version of the snap above? If yes, click on it and then follow the 'all sizes' option. nevard_100704_pithead_IMG_7389_web, originally uploaded by nevardmedia. 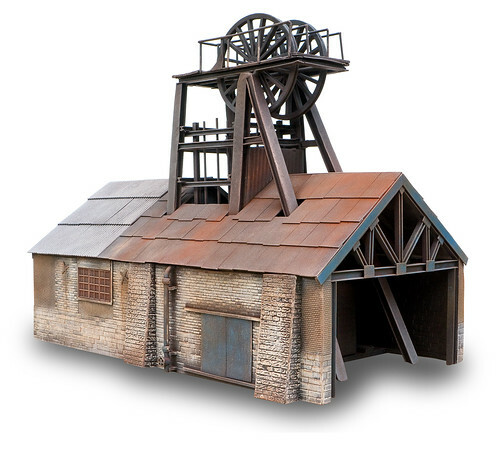 Mendip/North Somerset style scratch built pit head building based around a Bachmann Scenecraft pit head - nothing like a good day taking in the sun as well as some model making to get good progress! nevard_100703_pithead_IMG_7372_web, originally uploaded by nevardmedia. I love this time of year, because I can sit under our apple tree to do some model making. The other joy is that the odd tiny bits of detritus that would need to be hoovered up end up on the lawn, these then disappear when I cut it in a day or two. The building here is styled an amalgam of various North Somerset style pit head buildings, many of which were made up and extended from various materials - ideal for using up all those odds and ends of embossed plastic sheet. 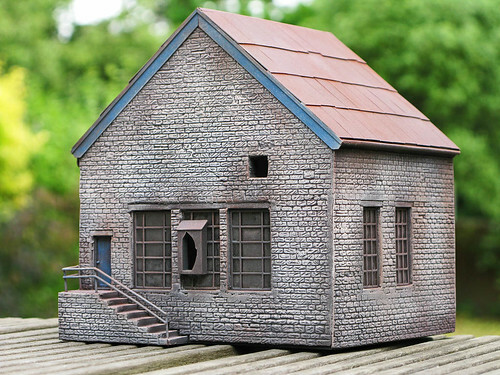 The pit head is Bachmann Scenecraft with some of the toy like corrugated iron (well I think that's what it's supposed to be) removed with a hacksaw and then incorporated into the scratchbuilt building here. nevard_100702_windinh-house_IMG_7350_web, originally uploaded by nevardmedia. Stone cladding was a popular move in the 1960's and 1970's with the lower middle classes who wanted to make their semi or terrace look more 'upmarket' or individual. It's one of those ghastly fads that went hand in hand with owning a beige coloured Austin Allegro and drinking Blue Nunn. 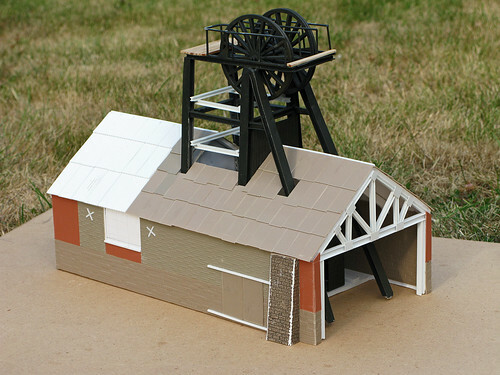 My reason is simply that I had this Bachmann Scenecraft 44-026 Hampton Heath Colliery Winding House in brick, and a desire to make it look more in keeping with the North Somerset with its distinctive white Lias limestone. Of course, matching up the overlays isn't the easiest of tasks, with that in mind the time factor is probably about the same as building from scratch! Clever people will spot the badly matched stones where they meet at the corners - remedy will be to add a downpipe just in the right spot to hide my botched model making! In addition to cladding the building with some stone effect sheets I had left over from Old Quarry Wharf's edge, I also decided to hide the rather clumsy slates with some corrugated effect sheeting. This project is more 'because it can be done' and it could be useful to those who already own such buildings and want to have a bash at elevating their ready-to-plant buildings to something better than the Jones' next door.